Despite a strong alliance, Japan’s stern response to U.S. military accidents is predictable. On December 13, 2016, a U.S. Marine Corps MV-22 Osprey tiltrotor aircraft made an emergency landing off the coast of Nago, Okinawa; five were injured. Then-Minister of Defense Tomomi Inada called for a total shutdown of U.S. Osprey flights; they resumed three days later. On August 5, 2017, an Osprey crashed in the Pacific Ocean off the coast of Australia during routine training operations; three service members were lost. Two days after the accident Minster of Defense Itsunori Onodera, just one week into his current position, asked the United States to cease all Osprey operations in Japan — even though the accident occurred far from Japanese shores. On October 12, a U.S. Marine Corps CH-53 Stallion helicopter caught fire inflight and was forced to land on civilian property; no injuries or damage occurred. Once again, Onodera asked for the United States to halt all operations; the U.S. military gave him five days’ respite before resuming CH-53 operations. Accidents like these strain the U.S.-Japan relationship. Japanese citizens see a thoughtless U.S. military continuing to roll the dice with dangerous aircraft operations; Americans see an ungrateful Japan that doesn’t appreciate U.S. efforts to defend it. But these perceptions are only skin deep; it is important to understand why the government of Japan continues to make issue of U.S. aircraft accidents. The answer lies in domestic politics. From the Japanese perspective, the central government has no choice but to comment on the accidents, no matter how many fatalities are involved. After 70 years of peace, pacifist education, and a populace which believes the Self-Defense Forces are more a uniformed disaster-response team than an armed organization dedicated to the defense of Japan, the Japanese polity simply doesn’t understand how complicated military operations carry a degree of risk, which occasionally results in fatal accidents. Nor do they understand that the United States’ most advanced military equipment — often deployed first to Japan, out of a long list of many desiring countries — are more risk-prone than well-established equipment by its very nature of being new and advanced. Japanese citizens, and especially Okinawa Prefecture residents, just like American citizens, take accidents out on their leaders. After years of chilly dialogue between the Okinawan and central governments, a stalled Futenma Marine Base relocation plan, and subsidies paid to residents gradually decreasing in effectiveness, the Japanese central government can ill afford another reason for Okinawa Prefecture to despise them. The careful student will note reactions to U.S. aircraft accidents increase in severity in proportion to the election cycle; the October 12 accident occurred scarcely three weeks after Prime Minister Shinzo Abe called for a snap Lower House general election, which practically mandated a government response calling for total cessation of operations. Continually lost in the headlines after an accident are the different perspectives from both the U.S. and Japanese positions. After an accident, Japan usually insists the U.S. military take immediate action to safeguard its aircraft or cease flying altogether; the U.S. side generally asserts their aircrews did a superb job given the difficult circumstances, usually noting how the ill-fated aircraft successfully steered away from urban areas and the like, and how the accident could have been much worse. Both sides are right, but getting lost in translation are the cultural nuances needed to advance the conversation. The American side finds it distasteful to apologize for unavoidable accidents undertaken in its efforts to defend the very country that is complaining; the Japanese side, while understanding this completely, requires an apology to save face with citizens and to avoid domestic political fallout which could potentially bring down the ruling party — a concern which will, sadly, always override the sometimes tragic nature of accidents. What the Japanese central government doesn’t say after accidents is also worth noting, and represents a positive reminder of the strength of U.S.-Japan relations. For instance, the Japan side never criticizes the aircrews, U.S. military personnel, or U.S. leadership. The U.S. side could also do more to help itself. To date, the best response to accidents U.S. leaders in Japan seem capable of is ripping away entire bases’ liberties, despite a Japanese government that only requires the United States to say something publicly so they may save face. Instead of shackling entire legions, U.S. leaders ultimately responsible for reacting to accidents should take their cue from the late ambassador to Japan, Mike Mansfield. Mansfield presided over the Nissho Maru incident*, a tragedy that occurred in April 1981 when the U.S. Navy submarine USS George Washington collided with a Japanese cargo vessel, sinking the boat and killing two of its crew. Rather than placing Naval Forces Japan in chains, Mansfield called a press conference, apologized in Japanese and accompanied it with a deep and solemn bow. It was not a trick; it was a legitimate and authentic expression of remorse, and within months — and after punishing those actually responsible — the incident no longer affected U.S.-Japan relations. Accidents are an inescapable part of military operations – for Japan as well as the United States. In August, a Japanese SH-60J helicopter crashed in northern Japan, and a UH-60J helicopter vanished during training on October 17, only days after the CH-53 accident. As Japan continues to build and modernize its defense enterprise under the Abe administration and future administrations, it should take care not to overplay its hand after future U.S. accidents. 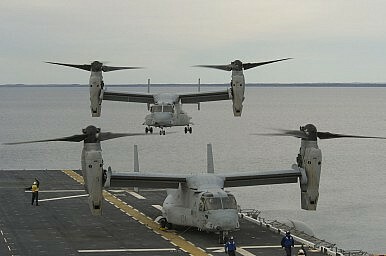 Japan has committed to buying the V-22 Osprey itself, a $545 million deal concluded in July 2016 with operations set to begin in April 2019. Domestic strife originating with U.S. Osprey flights, then, may have an expiration date — much to the relief of U.S. forces and diplomats — but Japanese forces could very soon be the inheritor of Osprey-induced rancor. In any case, Japan would do well to prepare its citizenry for the tragic realities of operating cutting-edge military equipment, a necessary evil in an increasingly challenging regional security environment. *A previous version of this article erroneously referred to the Ehime Maru incident, which occurred in 2001. Major John Wright is a U.S. Air Force officer, pilot, and a Mike and Maureen Mansfield Fellow. He is currently serving as Japan Country Director, International Affairs, Headquarters Pacific Air Forces, Honolulu, HI. The views expressed in this article are solely those of the author, and not those of the U.S. Air Force, U.S. Government, Mansfield Foundation, or the Government of Japan. Denny Tamaki met with Prime Minister Abe and the U.S. embassy after a recent referendum rejecting a new U.S. base.